The beach known as Traigh Iar, near Horgabost, on the Isle of Harris. A number of the victim’s companions – believed to be all part of a photography group visiting from England – watched in horror as tragedy struck at Nisabost beach on Harris at around 8am yesterday. The Coastguard was alerted and sent the Stornoway-based rescue helicopter, teams from Scalpa, Tarbert and Stornoway, and the Leverburgh RNLI lifeboat. The 50-year-old was recovered from the water by the helicopter and taken to the Western Isles Hospital in Stornoway, on neighbouring Lewis, but Police Scotland later confirmed she had died. 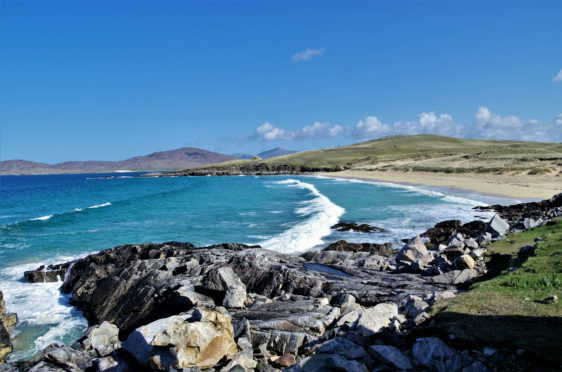 Local politicians last night described their “shock” at the tragedy – the second death in waters off Harris in recent years after a 45-year-old woman drowned off Scarista beach in 2013. Councillor John Mitchel, who also represents Harris, said it was believed the woman was a member of a photography group from England staying on the island. He said: “It is a terrible tragedy. It appears she was part of a photography group of holidaymakers who went to capture one of our many beautiful beaches early in the morning. “The rocks are very slippery and where she fell is near a standing stone called Clach Mhic Leòid (MacLeod’s Stone) – maybe she was trying to get this in the shot.